The place was perfect for family with kids. The beach was walking distance from the apartment. the pool was very nice and not crowded. You could always find a bed to lie down besides the pool. Very good place for the price. We enjoyed having an apartment where we could prepare our own meals, as well as enjoy the courtyard area which was very quiet and relaxing. Estepona is only ten minutes away and there is an excellent shopping centre nearby where groceries, as well as fresh vegetables and fish are readily available. There is also free Wi-fi for use at the shopping centre's cafe, which adds to the convenience. Lovely location. Well kept gardens. Great having beach access and nice walks along beach. Easy access to bus stop and easy to get around by bus. Very quiet and relaxing. Very nice pool area. Almost a park in the centre of the resort. Only 50 meters to the beach. 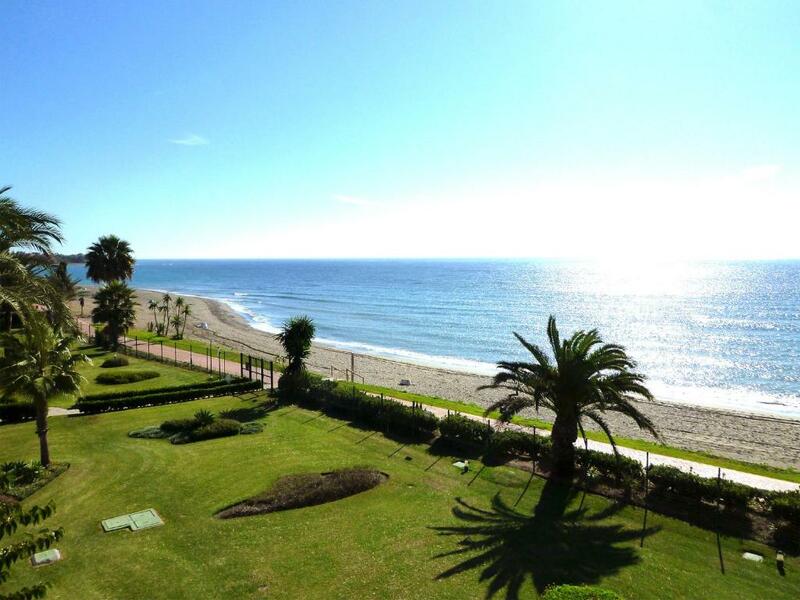 Very nice location, close to Estepona, Marbella and Porte Banus. The apartment was big with two bedrooms and baths. Rooms clean and with plenty of room. Any additional requests e.g. light bulbs etc. attended to immediately. The agent was very helpful and accommodating. 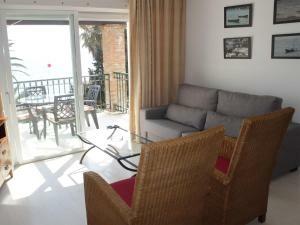 Excellent views, good pool facility although partly closed due to time of year. Even if the app we rented seemed bit old it was very clean and totaly in value for what we have paid. We staid with 2 but can easely stay 4.The locationis great when you have a car. Fantastic morning walks right in front with beach. Balcony with sea view was excellent. Beautiful green garden with different trees and flowers. Nice clean pool and enough sunbeds. Lovely bar with nice helpful staff. Well secured building/garden/parking. Very quiet and clean beach with showering. 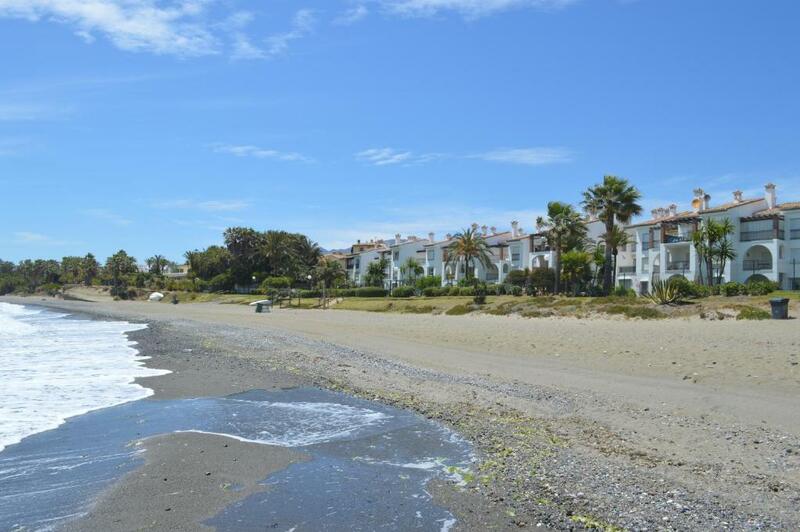 One of our top picks in Estepona.Set on the beachfront, 4.3 mi from Estepona, Hacienda Beach offers air-conditioned apartments with a private balcony. Featuring a shared swimming pool and padel tennis court, the property has a poolside bar. Each bright apartment features a living room with a sofa bed and TV. The kitchenette includes a microwave and kitchenware, while the bathroom has a shower. Some apartments also offer sea views. There is a separate children’s pool and a playground. You can find various beachside restaurants within a 5-minute walk of the property. Puerto Banus is a 10-minute drive from the apartments. Hacienda Beach Apartments offers car hire and Malaga Airport can be reached by car in 45 minutes. When would you like to stay at Hacienda Beach? This air-conditioned apartment offers a balcony with views of the pool. It has a double bedroom, a twin bedroom and a bathroom with a shower. The living area features a sofa bed and a kitchenette with a microwave and kitchenware. This air-conditioned apartment offers a balcony with views of the pool. It has 2 twin bedrooms and a bathroom with a shower. The living area features a kitchenette with a microwave and kitchenware. This air-conditioned apartment offers a balcony with sea views. It has a twin bedroom, a double bedroom and a bathroom with a shower. The living area features a sofa bed and a kitchenette with a microwave and kitchenware. This apartment features a balcony, air conditioning and kitchenette. Fabulous location in a front line beach location. Costa del Sol holiday rental agency established in 2.000. WiFi is available in some hotel rooms and costs EUR 5 per 24 hours. House Rules Hacienda Beach takes special requests – add in the next step! Hacienda Beach accepts these cards and reserves the right to temporarily hold an amount prior to arrival. Please provide the property in advance with the identity card or passport details of each guest. You can use the Special Requests box when booking, or contact the property directly via the contact email address provided in your confirmation. Please note that guests are only allowed to bathe in the swimming pool wearing a swimsuit. Please inform Hacienda Beach of your expected arrival time in advance. You can use the Special Requests box when booking, or contact the property directly using the contact details in your confirmation. The beds were very uncomfortable. Nothing that would be classed as important. The Wi-Fi charge of E20 was a bit on the high side. E10 would have been more like it. No english TV channels available and no great choice of other TV . No Wi Fi in the apartment. The on site supermarket was closed causing great inconvenience and extra expense. The location of the apartments was not close enough to a good choice of restaurants or entertainment. The apartment is in need of some updating and particulary electrical maintenance. The decoration was a bit old and I had understood that I had chosen the app with sea view. Which I apperently did not. No big deal as we are never inside but for longer stay would recommend it ! Extra bed (sofa in living room for 5th person) was not comfortable. Gardener who started work too early with too loud maschines. The only thing I didn't like was its quite a distance from the town and right on the dual carriage way although in fairest you couldn't hear it and their was no very close supermarket. In my opinion you defiantly need a car But if you don't like travelling around too much this is defiantly for you. The view is amazing and beautiful garden. The apartment is very comfortable. The balcony is huge where you can enjoy the see view. The person that gave us the keys was not very helpful. Called as we could not find the place and they would not pick up the phone. Departure day he was at the door at 11am asking us to leave and when we asked for a few more minutes he started getting angry saying 11am was policy. For that reason will not go back. The family running the pool restaurant were amazing. Super friendly and food was great. The beach is lovely very clean and sandy.